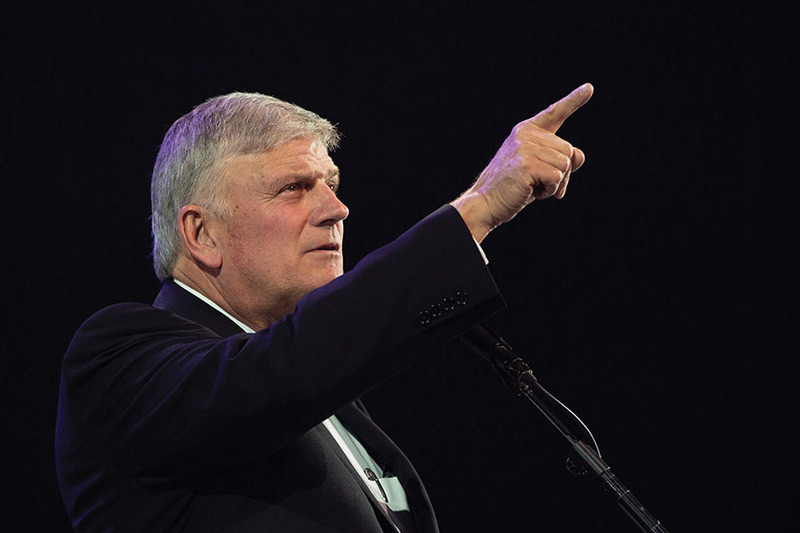 Franklin Graham Festival Lancashire, UK, September 2018. Two years ago, I said that the 2016 presidential election was the most important election of my lifetime. That was because of one compelling reason—the new president would be responsible for nominating at least one and probably several more justices to the U.S. Supreme Court. Today, the direction of the Supreme Court is still the single most crucial issue facing our nation, which means that this November’s midterm elections are once again the most important we have ever faced. The spectacle surrounding the Supreme Court nomination of Judge Brett Kavanaugh is just a foreshadowing of what we can expect if progressive-liberal socialists rule our country. And believe me, they are doing whatever they can—no matter how devious and disgusting—to see their own godless agenda forced upon us. The entire rationale behind the controversy in these hearings, seen around the world, wasn’t about what Judge Kavanaugh did or didn’t do as a teenager. It was really about the ideological advance of progressive socialists who were intent on stopping a judicial conservative from being appointed to the Supreme Court. For several decades, the highest court in the land has grown decidedly liberal. Worse, the court has rendered ruling after ruling that rejected the Biblical foundation for our laws, allowing hostility toward Christians to grow. Christian professionals who operated their businesses according to their Biblically informed worldview were under constant attack at the federal, state and local levels. The court system across our nation has been under the progressive sway of hundreds of extremely liberal judges appointed under the Obama administration. Bakers, florists, photographers, inn owners and others have been targeted, prosecuted and even fined by state agencies and the court system. Meanwhile, cleverly invented laws favoring the homosexual community have been pervasively promoted and upheld by the judicial system, even to the extent that in the 2015 Supreme Court case of Obergefell v. Hodges, marriage itself is no longer defined as between one man and one woman. Our highest court has rejected God’s standards. The Bible shows us how, time after time, this means trouble. While a number of state legislatures across the country sought to protect the life of the unborn, federal and district courts struck down statute after statute, effectively thwarting the democratic process and ignoring the growing body of scientific evidence that overwhelmingly demonstrated the egregious injustice of the 1973 Roe v. Wade ruling. When the American electorate put Donald Trump in our nation’s highest office, he did exactly what he promised to do in his campaign, and exactly what our nation needed. He appointed a conservative judge to the Supreme Court to fill the seat vacated by the death of Justice Antonin Scalia. Already, Justice Neil Gorsuch has proven to be a friend of religious liberty, and no doubt will be for many decades to come! It’s no surprise, then, that the nomination of Judge Brett Kavanaugh to replace the retired Anthony Kennedy was marked by vitriol from progressive leftists who were scared to death the confirmation will constrain the court to rulings that faithfully reflect the wise underpinnings of our founders. Socialist progressives know what is at stake—including the possible overturn of Roe v. Wade—and they have been willing to employ any scheme conceivable. The further our nation moves away from God, the quicker our descent into greater moral depravity and chaos. I fear for what is in store for our children and grandchildren. I am afraid that what we saw during the recent televised hearings has embarrassed our nation before the world. We’ve sunken civility and reasonable dialogue in the political arena to stunning new depths. As Judge Kavanaugh remarked during the hearing, we have “sown the wind” and will “reap the whirlwind,” a familiar Biblical phrase from the Book of Hosea. Since President Trump was elected, he has appointed more than 120 judges—virtually all judicial conservatives with respect for the Constitution as originally written, including the First Amendment right of free exercise of religion. Kavanaugh’s eventual confirmation by the Senate on a 50-48 vote will certainly be advantageous in a host of key upcoming decisions coming before the Supreme Court. But make no mistake, the progressive left is not giving up. Already, they are looking for ways to impeach Justice Kavanaugh. If liberal progressives gain control of the House and/or the Senate, then new conservative justices will have little if any chance of being confirmed. And remember, there is the distinct possibility that other justices will retire over the next few years. So as you consider candidates for the Nov. 6 elections, ask yourself this question: Whom do I trust to vote for legislation and to approve the nomination of judges and justices who will defend our religious liberties, protect the lives of the unborn and safeguard the rights of believers to live and work according to the dictates of their Biblically informed conscience? There is a battle raging between good and evil, between right and wrong, between light and darkness. It’s not new, but it certainly has intensified in a very public way. The battle is raging in the halls of Congress, on the Senate floor, in the Supreme Court and on the media airwaves. It is raging in our city councils and school boards across America. The Bible says, “Woe to those who call evil good, and good evil; who put darkness for light, and light for darkness; who put bitter for sweet, and sweet for bitter” (Isaiah 5:20). The further our nation moves away from God, the quicker our descent into greater moral depravity and chaos. I fear for what is in store for our children and grandchildren. That is why I am encouraging everyone to go out on Nov. 6 and vote for the candidate who is most closely aligned with Biblical values. And remember to study the positions of candidates in your local and state races as well as in the national elections. More than 6,600 state positions are being contested, including 36 governorships. Vote for those who are pro-life and who support the religious liberties that have undergirded our nation for centuries. Above all, pray that God will have mercy on our nation and that we will once again turn back to the God of our fathers.